Here are some maps of Pai. As of September 2017, Google has the best online map of Pai for seeing satellite imagery, roads, and street view (but not business search). It took them forever, but in 2011 Google finally put Pai on the map with proper imagery. A handful of businesses have started adding themselves to the Pai Google Map but this is an ongoing process, hampered by the fact that businesses wanting to add themselves have to receive a little postcard from Google that almost always gets lost at the post office because Google puts the wrong Thai address! Pai's GPS coordinates are (19.358889, 98.436667). You can access satellite and street maps from all the online services at the Wikipedia GeoHack site for Pai. 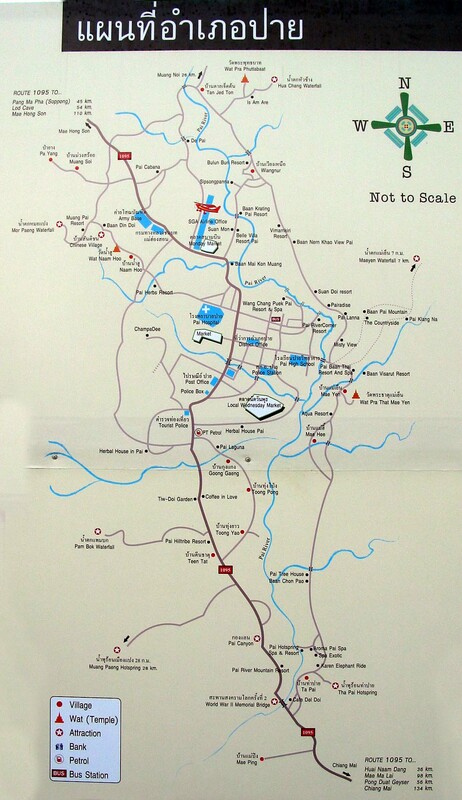 For the purposes of finding attractions and businesses, the best maps of Pai are the ad-laden printed maps you can get in town for free or almost free. Someone might just shove one in your face when you get off the bus, or you can find them in boxes at minimart counters and many guesthouses. 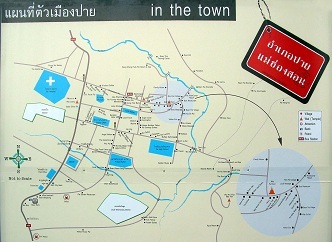 Travelfish has an interactive map of Pai which shows destinations that have travelfish listings. Here is a similar interactive map from TripAdvisor. 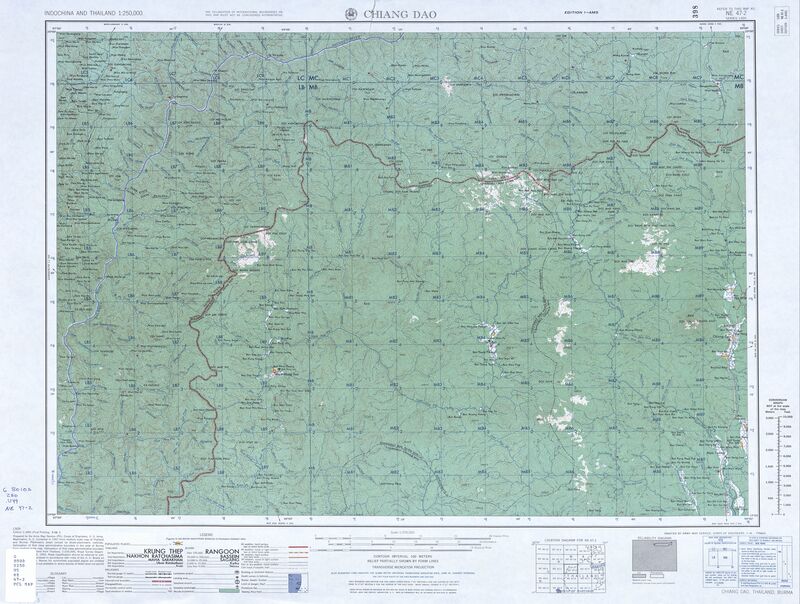 The Royal Thai Survey department publishes excellent 1:50,000 topographical contour maps of the whole country (except a few sensitive border areas with Burma; Pai is close but fortunately not censored). 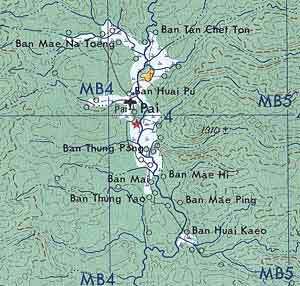 The maps are based on satellite imagery from 1992 (and, we hear, original US military survey data from many decades earlier) but they are by far the best resource available for trekking and getting any sense of the terrain of the region. 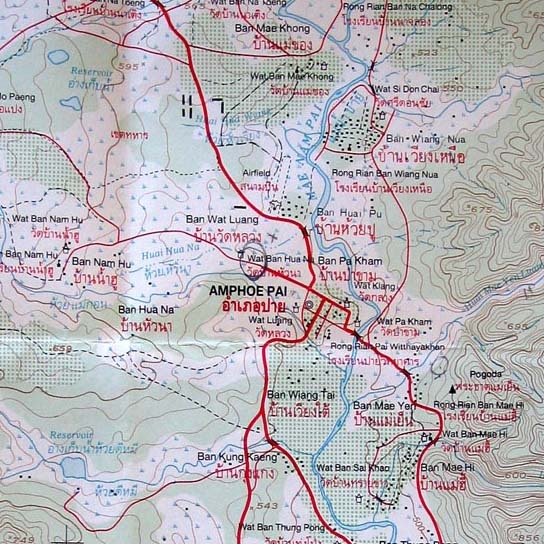 Amphoe Pai (Pai District) is covered by Sheet 4647 I of series L7017S edition 1-RTSD. There are also sheets available for nearly all adjoining quadrants. 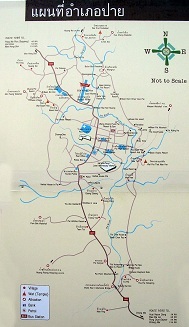 As you can see, the map is detailed but out of date (for example, the major road that turns north off the highway, passes Belle Villa, and goes to Ban Wiang Nua was not yet built when the map was made and is just a dotted line. 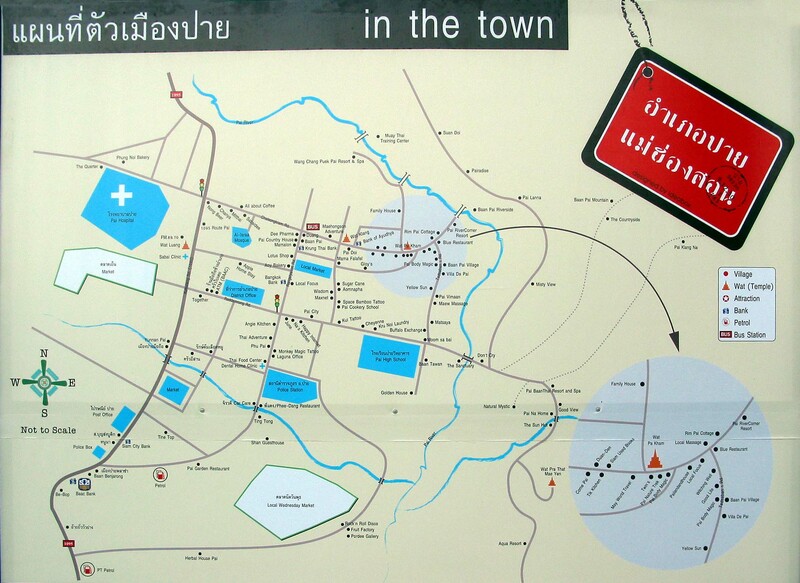 You can purchase these maps at Suriwong Book Center in Chiang Mai (and sometimes also DK Books Chiang Mai or the large art suppy store on Ratwithi road). You can also purchase these maps online at several different websites. 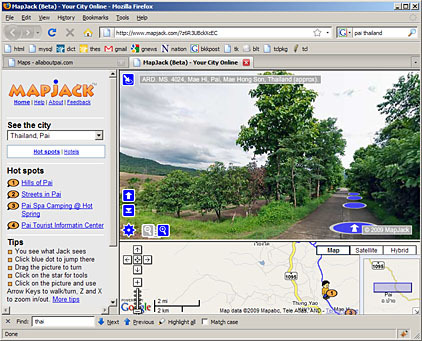 MapJack was a spunky startup that jumped on the scene in 2009 to challenge Google Street View with superior imagery and feaures, beginning with several demonstration cities in Thailand including Pai. Well, as you might expect, Goliath won, but what we ended up with is a fascinating snapshot-in-time of the Pai of 2009. I hope they keep the images for posterity but I expect the site will disappear at some point. Looks like Pai had an airport then, and a military one at that! No highway either; just a dim dotted grey line where the crappy "road" leads to Chiang Mai.